Pursuit of Poppy: Keep 'em coming! I've been getting tons of fabric squares for the 100 Good Wishes Quilt lately! 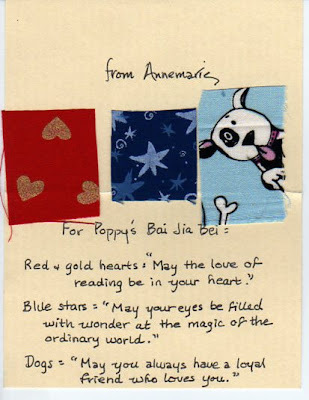 These are from my MIL's friend, Annmarie, who is also a school librarian. Her gift at my baby shower was, of course, tons of books! Really good picture books, board books and even a homemade CD of lullabies. Super special. This is such an awesome square! Thanks for your suggestion on the high chair-- I will definitely check those out.